The other day I got my very first delivery from Abel & Cole, an award winning company delivering organic farm produce to your door. The one thing I truly miss in London is real flavours. Since most of fruit and vegetables are imported and mass-produced so that they can be available all year round, everything ends up tasting like water. I have always been very lucky as my family are able to grow fruit and vegetables for most of the year so when I go home I can enjoy tasteful seasonal colours. When I received my order and saw that the courgettes still had fur I was about to cry of joy. I almost forgot what their real texture feels like at the touch. I am not going crazy, I promise. Mr Courgette here can confirm. This recipe is not rocket science but it’s made to enhance true simple flavours. Drizzle olive oil on the bottom of a non-stick baking gastro. 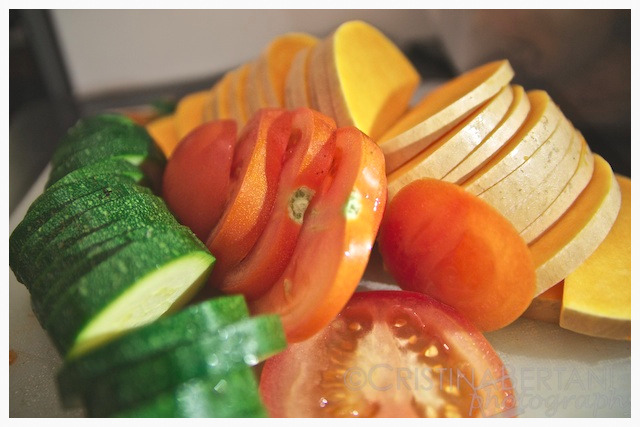 Slice all veggies about half cm wide and dispose them in the container. Salt and pepper to taste, add some thyme (fresh would be better but the dry one goes nicely too) and some more olive oil on top. Bake in the oven at 200°C ventilated for 35′-40′. When ready, let rest for a couple of minutes, then drizzle with balsamic vinegar and scatter some fresh basil on top. They went perfectly with those lamb steaks we had for dinner – and I am not even a big fan of lamb. I’d like some fresh, clear, well seasoned perspective. Can you suggest a good wine to go with that? Thank you! I’m sure you’re gonna love it. Let me know how it goes.